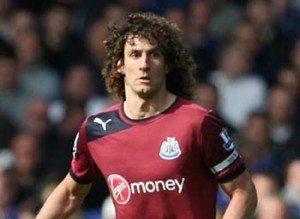 The resemblance between Chelsea’s David Luiz and Fabricio Coloccini is uncanny. The flowing curling hairstyle, the spare physique and of course the neat footballing skills, are shared by both players as well. However, so are some of the pundit/experts’ comments about weaknesses; lack of strength, lapses in concentration, and the impression they give that they are not, first and foremost, defenders. I believe they are natural midfielders where their constructive talent and ball playing skills would be better employed. An interesting thought as we look at the strengths and weaknesses of Newcastle United this season.